Isaiah said to Hezekiah the king . . . "And Sammael Malkira [that is, Satan] will serve Manasseh and will do everything he wishes, and [Manasseh] will be a follower of Beliar [that is, Satan] rather than of me. He will cause many in Jerusalem and Judah to desert the true faith, and Beliar will dwell in Manasseh, and by his hands I will be sawn in half." Because of these visions, therefore, Beliar was angry with Isaiah, and he dwelt in the heart of Manasseh, and he sawed Isaiah in half with a wood saw. And while Isaiah was being sawed in half. . . .
And he said this to him when he began to be sawed in half. And Isaiah was in a vision of the Lord, but his eyes were open, and he saw them. . . .
And they seized Isaiah the son of Amoz and sawed him in half with a wood saw. . . .
(A) A Tanna recited: Shimon ben Azai says, "I found a scroll of genealogical records in Jerusalem and in it was written, 'So-and-so is a mamzer from a married woman.' . . . and in it was written, 'Manasseh killed Isaiah.'" The most obvious similarity between the accounts in the Bavli and the Ascension is the depiction of Manasseh killing Isaiah by sawing him in half. Equally significant, however, is the fact that the Ascension and the Bavli depict the execution as the result of specific accusations brought by Manasseh against Isaiah, one of which is identical in the two accounts. To be specific, according to both accounts Manasseh's charge that Isaiah claims, in contradiction to Moses, to have seen "the Lord seated on a high and lofty throne" (Isa 6:1) provoked outrage and led to his execution. According to the Ascension no less than according to the Bavli, therefore, it is appropriate to say that "[Manasseh] judged [Isaiah] and killed him," although these exact words are recorded only in the Bavli's account. It is unclear whether or not the Bavli's account of the sin that actually caused Isaiah's death (part E: "When he reached [Isaiah's] mouth, he died, because [Isaiah] said, 'And I live among a people of unclean lips'") owes anything to earlier versions of the legend. The Bavli's explanation for Isaiah's death is similar but not identical to the reason given in the Ascension, since in the Ascension Satan becomes furious because of Isaiah's prophecies about (a) the wickedness of Jerusalem and the princes of Judah and Jerusalem, and (b) the destruction that awaits Jerusalem and the cities of Judah. According to Ascension 3:6-10, Isaiah's prophecies are of catastrophes that will befall Israel and the king, and Isaiah also angers Manasseh because "he has called Jerusalem Sodom, and the princes of Judah and Jerusalem he has declared [to be] the people of Gomorrah." So it would appear that for the author of the Ascension, part of Isaiah's "crime" (according to Beliar [ = Satan] and his minions) was his denunciation of the Israelites. The Bavli is unique among all extant versions of the Isaiah legend, however, in characterizing as Isaiah's crime his assertion that he dwells among a people of unclean lips, and in making his punishment measure for measure. Rava's claim that Manasseh "judged him and killed him" and the accusations against Isaiah that follow (parts B-C) compose a surprisingly sympathetic, or at least ambiguous, portrayal of Manasseh. M. Sanhedrin 10:2 contains a Tannaitic dispute about whether or not Manasseh fully repented and thereby inherited a portion in the world to come, and Bavli Yevamot may reflect the opinion that the king did repent. Contributing to this sympathetic or less than clearly negative portrayal is the fact that Bavli Yevamot portrays Manasseh as innocent of murder, since Isaiah deliberately says nothing in response to Manasseh's charges. Manasseh's objections against Isaiah are serious and demand a response, however, as indicated by the fact that the Bavli's anonymous editors (parts F-H) feel the need to respond to them. And suddenly the curtain was drawn back again, and the judge cried aloud and said, "As regards this Sharbil, who was formerly priest of the gods, but has turned this day and renounced the gods, and has cried aloud, 'I am a Christian,' and has not trembled at the gods, but has insulted them; and, further, has not been afraid of the emperors and their command; and, though I have bidden him sacrifice to the gods according to his former custom, has not sacrificed, but has treated them with the greatest insult: I have looked into the matter, and decided, that towards a man who does these things, even though he were now to sacrifice, it is not fit that any mercy should be shown; and that it is not fit that he should any longer behold the sun of his lords, because he has scorned their laws. I give sentence that, according to the laws of the emperors, a strap be thrust into the mouth of the insulter, as into the mouth of a murderer, and that he depart outside of the city of the emperors with haste, as one who has insulted the lords of the city and the gods who hold authority over it. I give sentence that he be sawn with a saw of wood, and that, when he is near to die, then his head be taken off with the sword of the executioner." And at the same moment the strap was suddenly thrust into his mouth, and the executioners seized him. . . . And they offered him some wine to drink, according to the custom of murderers to drink. But he said to them, "I will not drink, because I wish to feel the saw with which you saw me, and the sword which you push over my neck. . . . "
They brought carpenters' instruments and thrust him into a wooden vise, and tightened it upon him until the bones of his joints creaked with the pressure, then they put upon him a saw of iron, and began sawing him asunder; and, when he was just about to die, because the saw had reached his mouth, they smote him with the sword and took off his head, while he was still squeezed down in the vise. In the Bavli's story the protagonist dies when they reach his mouth and in the story of Sharbil the executioners lop off his head when they reach the mouth, so the motif does not play out exactly the same in the two contexts, but in both narratives the point is that the protagonist's mouth plays a crucial role in the "crime" that leads to his execution, and in the working out of the execution. In the Sharbil tale the executioners make the point that their victim's crime was that of "insulting the gods" by "crying aloud, 'I am a Christian,'" the standard climax of Christian accounts of late antique martyrology trials. In the story of Isaiah's martyrdom in the Bavli, in contrast, the critical role of the mouth in the death of the martyr is not a sign of his saintliness and heroism, but rather a symbol of the sin he committed for which he is punished. While the precise relationship between the Christian and the rabbinic stories is difficult to determine at present, as is the significance of the difference between the way the motifs are utilized in the two literatures, the centrality of the motifs of speech and the mouth in the Sharbil tale supports my claim that these motifs are an important hermeneutical key to the meaning of the Bavli's story as well. One might be inclined to see in Bavli Yevamot's high opinion of Moses and surprisingly low, or at least ambivalent, opinion of Isaiah an attempt to deliver the message that the power of the rabbi (Moses) is greater than that of the prophet (Isaiah). When we examine the passage more closely, however, we see that this explanation is unsatisfactory. First, Isaiah apparently knows how to answer Manasseh's objections; he just refrained from doing so. And as Manasseh says, Moses is Isaiah's rav, apparently proof that Isaiah is also a rabbi. So the operative distinction is not rabbis versus prophets, but the specific figure of Moses (who is both a rabbi and a prophet) versus the specific figure of Isaiah (also both a rabbi and a prophet), probably viewed as paradigmatic of or superior to all other non-Mosaic prophets. Isaiah is Moses's inferior as a prophet: Moses saw clearly; Isaiah and other prophets did not. And Isaiah condemned the Israelites and Moses apparently did not. Isaiah is also lacking as a rabbi: Isaiah did not respond to the objections posed by the king, even though the situation demanded a response, and it is a rabbi's stock-in-trade to respond to objections posed against problematic traditions. Presumably this discussion is directed against those rabbis or nonrabbis, Jews or non-Jews, who favored Isaiah (and other prophets) over Moses himself. The Ascension of Isaiah clearly favored Isaiah over Moses. According to the Ascension, Isaiah had visions of the Beloved, the seven heavens, the incarnation, and the resurrection, and therefore Isaiah clearly saw more than Moses. There may or may not have been direct dependence of the Bavli upon the Ascension, but even if there was not, and the two texts instead drew upon common sources, the Ascension gives us a good idea of the kinds of traditions and cultural tensions that provided the background of the Bavli's discussion. Another important theme in Bavli Yevamot is the anonymous editorial claim (part G, responding to the objection in part C) that God is always responsive to petitions by the community of Israel. God has not abandoned the Jewish people, and even the individual Jew can always count on a sympathetic hearing from God during a critical time in the Jewish liturgical calendar, between Rosh Hashanah and Yom Kippur (part I). The God of Israel continues to have a special relationship with Jews, both individually and as a people. Also crucial to the Bavli is the issue of the biblical prophets' condemnation of the Israelites. According to the Bavli, the only one responsible for the death of Isaiah is Manasseh, and as noted, even Manasseh may be portrayed as relatively benign. There is no hint in the Bavli that the Israelites are implicated in Isaiah's murder, and in fact Isaiah's death is described as deserved punishment for his harsh words about the Israelites. We will see that the parallel text in the Yerushalmi likewise blames only the king, but numerous voices in late antiquity and the early Middle Ages implicated the Israelites as well as (or instead of) the king. We saw above that the guilt of the Israelites for the death of Isaiah, and for much else besides, was an important concern of the Ascension of Isaiah, and Israelite guilt was likewise a central preoccupation of numerous other early Christian (and Jewish) authors. We will also see that Tabarī, a Muslim historian writing in Baghdad in the ninth and tenth centuries, cites a version of the story that blames the Israelites rather than the king for the murder of Isaiah. The issue of whether or not the biblical Israelites had been rejected by God on account of their sins or had maintained their status as God's special people was clearly a live one in antiquity and beyond. The absence of Israelite blame in both Talmuds could well be a rabbinic reworking of extant traditions that did blame the Israelites. There are also specific traditions in rabbinic compilations that provide important background for Bavli Yevamot's discussion. It is likely that Bavli Yevamot had some of these traditions before it, but it is unlikely that the Bavli's narrative had only these traditions, since some motifs are found only in Bavli Yevamot and in nonrabbinic literature deriving from the eastern Roman provinces. As noted, only in Bavli Yevamot and the Ascension of Isaiah does Manasseh level specific charges against Isaiah, "judging him" for his objectionable prophecies; and only in the Ascension, the Church Fathers, and Bavli Yevamot is it explicit that one of the charges against Isaiah was that he contradicted Moses by claiming to have seen "the Lord seated on a high and lofty throne" (Isa 6:1). (A) [Mishnah:] Three kings and four commoners have no portion in the world to come. Three kings: Jeroboam, Ahab, and Manasseh. R. Yehudah says, "Manasseh has a portion in the world to come, as it is said, 'Manasseh prayed to Him, and He granted his prayer, heard his plea, and returned him to Jerusalem to his kingdom'" (2 Chr 33:13). They said to [R. Yehudah], "He returned him to his kingdom, but He did not return him to life in the world to come." (B) [Talmud:] What did Manasseh do? . . .
(C) When Manasseh became king he ran after Isaiah. He wanted to kill him and [Isaiah] fled from before him. He fled to a cedar tree and the cedar tree swallowed him, except for the fringes of his cloak. They went and said before [Manasseh; that is, they told the king where Isaiah was hiding]. [Manasseh] said to them, "Go and saw the cedar tree." They sawed the cedar tree and blood was seen flowing. In the Yerushalmi, therefore, Manasseh alone (along with the unnamed individuals whom he orders to saw the tree) murders the prophet, and the text supplies no motive for the king's actions. According to the Yerushalmi, the story explains only what Manasseh did to lose his portion in the world to come. The reference to "blood . . . seen flowing" at the end of part C is an allusion to 2 Kings 21:16,"Manasseh also shed much innocent blood," according to which the Yerushalmi portrays Isaiah as the innocent victim of the murderous king. (D) But behold, it is written, "[Manasseh] also spilled much innocent blood until he filled Jerusalem [with blood] from end to end" [literally, "from mouth to mouth"] (2 Kgs 21:16). And is it possible for flesh and blood [that is, a human being] to fill Jerusalem with blood from end to end? Rather, [this verse refers to the fact] that he killed Isaiah, who was equal to Moses, about whom it was written, "Directly [literally, 'mouth to mouth'] I will speak to him" (Num 12:8). This passage understands 2 Kings 21:16 to say that "Manasseh filled Jerusalem with the innocent blood of Isaiah," and it interprets the phrase "from mouth to mouth" as a reference to both Isaiah and Moses. The text does not specify how Isaiah was "equal to Moses," but the reference is probably to their close communication with God, since the phrase "mouth to mouth" refers to Moses's close communication with God in Numbers 12:8. Bavli Yevamot, which insists upon Moses's superior vision of and communication with God, is clearly responding to the idea reflected in the Yerushalmi passage, and in fact might be responding to this very passage itself. The Yerushalmi in this context is clearly less sensitive than the Bavli to the dangers involved in overestimating the importance of non-Mosaic prophets. (A) "Moreover, Manasseh put so many innocent people to death that he filled Jerusalem [with blood] from end to end [literally, 'from mouth to mouth']-besides the sin he committed in causing Judah to do what was displeasing to the Lord" (2 Kgs 21:16). (B) Here [in Babylonia] they explained that [Manasseh] killed Isaiah. (C) In the west [that is, in Palestine] they said that [Manasseh] made an idol that was the weight of one thousand men, and every day he killed them all. (D) The statement by Rabbah bar bar Hanah: "The life of one righteous person is equal to that of the entire world," which tradition does it follow?" (E) It follows the one who said, "[Manasseh] killed Isaiah" [that is, part B]. Like the Yerushalmi passage above, the Bavli here claims that 2 Kings 21:16 refers specifically to Isaiah. And like the Yerushalmi, part of the Bavli's motivation is probably the phrase "mouth to mouth," which links this passage to the description of Moses in Numbers 12:8. The Yerushalmi and b. Sanhedrin 103b, therefore, maintain that Isaiah is the equal of Moses, and they do so by means of the phrase "mouth to mouth," which describes Moses's direct communication with God in Numbers 12:8. It is likely that Bavli Yevamot reacts against the evaluation of Isaiah vis-à-vis Moses found in b. Sanhedrin 103b, and it may be reacting against this specific text. As noted, however, the probable dependence of Bavli Yevamot on Bavli Sanhedrin and the Yerushalmi does not negate the significance of the parallel between the Ascension and Bavli Yevamot, since only in the latter two texts does Manasseh execute Isaiah in response to the specific charge that he blasphemously claimed to have seen God and lived, in contradiction to Moses's explicit claim that such was impossible. Thus far we have analyzed Jewish and Christian versions of the legend of Manasseh's execution of Isaiah. Scholars have drawn attention, however, to several important parallels in other literatures, although there is little scholarly consensus concerning the relationship between these parallel versions. Larionoff argued in the late nineteenth century, for example, that several of the motifs preserved in the Ascension and in rabbinic literature derive from an ancient Iranian legend, and James Russell, a prominent contemporary Iranologist, concurs.Larionoff argued that a story in the Avesta Yast 19.49, dating from no later than the end of the Achaemenid period, is the source of the Jewish, Christian, Arabic, and later Persian versions of the tradition. Russell notes the "striking resemblance" of the story of the martyrdom of Isaiah to the complex Iranian legend of the death of Yima, of which different and sometimes contradictory versions exist over a vast period, from the Avesta down to the tenth and eleventh century Shahname, also composed in Persia. Russell characterizes Yima as "the first king . . . and the first mortal," and says that "he becomes the king of the dead." In Iranian literature Yima "is regarded as a great and creative monarch who sins through hubris, believing he is divine because his medicines have made men immortal." According to the Avesta, Yima's brother, Spityura, kills Yima by cutting him in two with the help of a three-headed monster, Azi Dahaka. Larionoff's and Russell's theory is most likely incorrect, however. The only significant similarity between the Avestan and the later accounts is the fact that they all depict an important character's death by being cut in two. Gherardo Gnoli argued convincingly, however, that this similarity is of little significance, since the Avesta says that Yima was cut in pieces and not sawn in half, a conclusion confirmed by Bruce Lincoln's detailed philological study. In Persian literature, the motif of sawing appears only in later texts, in all likelihood due to the spread of the motifs incorporated into the various versions of the story of the martyrdom of Isaiah. Virtually everything else about the Avesta and the later accounts is different. If we confine the discussion to comparison between the Avesta and the Bavli, Isaiah in the Bavli is a prophet who dies as punishment for the sin of speaking against his people, whereas Yima is a king who dies for some sin that in the Avesta (as opposed to some later Persian texts) is ill defined. King Manasseh judges and executes Isaiah for contradicting the words of Moses, for which he does not deserve death, while a three-headed serpent kills Yima in the Persian tale and it is unclear whether or not his death is undeserved. The serpent rules after Yima's death, which likewise has no parallel in the rabbinic tale. As noted, however, there are many striking similarities between later Persian versions of the story of the execution of Yima and versions of the Isaiah story found in Jewish and Christian literature. There are also significant differences, however, and it is extremely difficult to describe the precise relationship between the various versions of the story. In the History of King Jamshed and the Demon, Jamshed (the Pahlavi version of the Avestan name Yima) is deposed by the man of serpents, Zohak (the Pahlavi version of the Avestan name Azi Dahaka). Zohak seizes Jamshed's throne, and the deposed king flees into the wilderness. After one hundred years, Ahriman (the evil god of Zoroastrianism) and Zohak come upon him in the wilderness and the good god causes a tree to open itself so that Jamshed can conceal himself inside. Ahriman and Zohak fail to find him until Iblis ( = the devil in Islamic thought) informs them. They order the tree to be sawn in two, and after several failures they succeed on the third day in killing Jamshed. In the tenth and eleventh centuries Shahname, Zahhak (an Arabicized version of the name Azi Dahaka), who had entered into a covenant with the evil god Ahriman, discovers Jamshed on the shores of the Sea of China after one hundred years of hiding, and has him sawn in two. The Shahname's version, significantly, lacks the motif of the tree. When Zedekiah, the aforementioned king of the Jews, passed away, the affairs of the Jews became confused. There was rivalry for the kingship. They killed one another to obtain it, and though their prophet Isaiah was among them, they did not turn to him nor did they listen to him. We heard that because they acted this way, God said to Isaiah, "Rise among thy people, let me send a revelation through you." When he rose, God inspired him. The prophet admonished them and filled them with fear about the vicissitudes of fate; he enumerated God's favors and fate's vicissitudes. As Isaiah finished his speech, they turned upon him to kill him, but the prophet fled from them. A tree that he passed split open, and he entered it. But Satan caught him and seized a fringe of his garment, which he showed to the pursuers. They set a saw across the middle of the tree and sawed through it, and Isaiah was sawed in two. According to this version, therefore, the Israelites murder the prophet during a chaos-filled interregnum. It is significant that Tabarī records the detail of a piece of Isaiah's cloak remaining outside the tree and giving away his hiding place. This detail argues in favor of the versions that record the same detail in the Bavli, since Tabarī was from modern-day Iran, near the Caspian Sea, and lived in Bagdad, in close proximity to the Babylonian rabbis. It is conceivable that Tabarī knows this detail, also found in the Yerushalmi, from his travels to Syria, Palestine, and Egypt, although in general Tabarī's accounts share much more in common with Babylonian than with Palestinian rabbinic literature. As noted, the Muslim version, like the Christian, blames Isaiah's murder on the whole Jewish people, a charge that the Jewish versions deny. What is the relationship between the various versions of this legend? As noted, clearly there are many striking parallels between them, but there are also many significant differences. In the Ascension and in the later Persian legends the murder of the protagonist is accomplished with the help of Satan, or Satan's counterpart, the evil god Ahriman. Tabarī also records this detail, but it is not in the Talmuds or in the Syriac Christian Acts of Sharbil from the fourth or fifth centuries. Tabarī, the Persian History of King Jamshed and the Demon, and both Talmuds have the protagonist fleeing into a tree, but this motif is absent from both the Ascension of Isaiah and the Shahname. As noted, the surviving evidence does not make possible the reconstruction of an ur-text. We can, however, speak of the priority of traditions that originated in the Roman East, which subsequently traveled further east to Mesopotamia and Persia. The earliest attestation of the tradition east of the Roman Empire is in the Babylonian Talmud, apparently by Rava in the mid-fourth century C.E. It is unlikely that we can reliably posit an original version of the story that had the detail of the protagonist hiding in a tree. Several scholars, unconvincingly in my view, argue on the basis of the specification of a "wood saw" that even those versions that lack a tree presume that Isaiah took refuge in a tree, which is why he died by being sawed in half. In actuality, however, there is no need to posit a tree to explain Isaiah's death by sawing, since it can easily be argued that the author of the Ascension chose this form of execution because it serves the narrative's purposes quite well. For example, perhaps the Ascension chose death by sawing to emphasize the execution's gradual, gruesome quality, particularly appropriate for the depraved king, in whose heart dwells Satan himself. Sawing allows for a slow, painful death by torture, with a fully conscious victim, and it permits the drama of the scene to gradually unfold and emphasizes the greatness of Isaiah and the power of the Holy Spirit. Yosi Mishitah, when the enemies [that is, the Romans] wanted to enter the Temple Mount, they said, "Let one of them [that is, one of the Jews] enter first." They said to [Yosi Mishitah], "Enter. Whatever you bring out is yours." [Yosi Mishitah] entered and brought out the golden menorah. [The Romans] said to him, "It is not the way for a commoner to use this; rather, enter a second time and whatever you bring out is yours." But he did not take it upon himself [to enter again]. R. Pinhas said, "[The Romans] gave him [that is, they freed him from the obligation of] taxes for three years but he did not take it upon himself [to enter again]." [Yosi Mishitah] said, "Is it not enough that I angered my God one time, that I should anger Him another time?" What did [the Romans] do to him? They placed him on a sawhorse and sawed him. Elsewhere, Suetonius writes that "[Caligula] cut many people . . . in two with a saw," and according to the Greek version of Amos 1:3, the Damascenes sawed asunder the Gileadite women. Further evidence for the claim that the account of Isaiah's martyrdom in the Ascension does not presuppose the detail of Isaiah's being swallowed up in a tree is the fact that no early Christian version of the story records this detail. We would expect the motif to be more widespread in the Roman East if it were such an integral part of the Christian legend. Richard Bernheimer, for example, observes that in a fifth- or sixth-century artistic rendering of the martyrdom scene in El Bagawat in Egypt, Isaiah "stands on a rack while two executioners saw him in the middle." Bernheimer further notes that Potamius, a fourth-century bishop of Lisbon, describes Isaiah's being sawn in half while standing "tall and splendid" and "in the immobile state of his unshaken body," while his torturers were bent back and twisted with the strain of their work. Such steadfastness presupposes that the motion of the saw was perpendicular, and Potamius informs us that the saw entered into the skull first, before it descended into the lower parts of the body. Bernheimer observes that this portrayal "gained literary acceptance" and eventually "became part of established medieval iconography." In any event, we see from this brief and incomplete survey that the motif of execution by saw is far from unprecedented in antiquity and the early Middle Ages. The vicissitudes of the motif of Satan's role in bringing about the death of the protagonist are also difficult to explain according to the ur-text model. As noted, this motif is present in the Ascension, in Tabarī, and in the early medieval Persian accounts, but it is missing from both Talmudic versions and from the Acts of Sharbil. It is possible that the Talmuds deliberately omitted Satan because of a desire on the authors' part to emphasize human responsibility and human agency, although there are certainly many cases when the rabbis assign to Satan a pivotal role in influencing or determining the motivations of a story's human characters. As noted, the precise relationships between the various versions of the story of Isaiah's execution are too complicated to disentangle with any degree of confidence. Nevertheless, a basic chronological and geographical picture emerges, such that it is possible to state in general terms that the chronological record of the various versions of the tradition is earlier in the Roman East than in Mesopotamia and Persia. As noted, the Yerushalmi was certainly composed in Palestine, and the Ascension also appears to have been composed there, although western Syria has also been proposed as a possible point of origin. The Ascension dates from the late first or early second century C.E., and the Yerushalmi was composed between the third and the early fifth centuries. The second- and third-century Church Fathers Justin, Tertullian, and Origen attest crucially important aspects of the tradition, and they all derive from the Greek and Roman world. The Bavli and the Acts of Sharbil attest many of the same motifs at approximately the same time and in the same part of the world: in northern and southern Mesopotamia in approximately the fourth or fifth centuries. The Muslim and Persian compilations that contain the tradition-the History of King Jamshed and the Demon, Tabarī, and the Shahname-were all composed in Persia and date from approximately the ninth to eleventh centuries. All of these facts, together with the fact that the Bavli, which contains traditions as old as the oldest traditions in the Yerushalmi, was completed approximately two centuries later than the Yerushalmi, make it likely that the tradition traveled from the Roman East to Mesopotamia and Persia. Examination of the peregrinations of a cluster of literary motifs, therefore, confirms my claim that Jewish Babylonia increasingly became part of the eastern provincial Roman world beginning in the fourth century C.E., and that Mesopotamia and the eastern Roman provinces, and the territory in between, increasingly formed a cultural unity during the period under discussion. Significantly, we found that the Babylonian Talmudic account contained similarities to the accounts in the Ascension and in some Church Fathers from the Roman world attested in no other ancient or medieval compilation, including the Yerushalmi. The traditions examined in this chapter thus support my claim in the introduction that attitudes or specific traditions found in compilations deriving from the Roman East made a greater impression on Babylonian than Palestinian rabbis. Finally, we found that one cluster of motifs achieved literary expression in Christian literature in close geographical and chronological proximity: fourth- or fifth-century Christian Edessa on the one hand and fourth-century rabbinic Babylonia on the other. This fact appears to indicate linkage between the literatures of the Jewish and Christian communities of Mesopotamia in late antiquity, since no record of this precise constellation of motifs is preserved in literature from Persia or from the Greek and Roman world. It is possible that these shared motifs are indicative of contact between the two communities in Mesopotamia itself during the Sasanian period, but minimally it indicates that they inhabit a common cultural sphere. Even if the shared motifs are not the result of direct contact, they nevertheless give us an idea of literary and conceptual linkages between the two communities, although we are far from being able to say precisely how close these linkages were or how frequent the patterns encountered in this example will turn out to be. 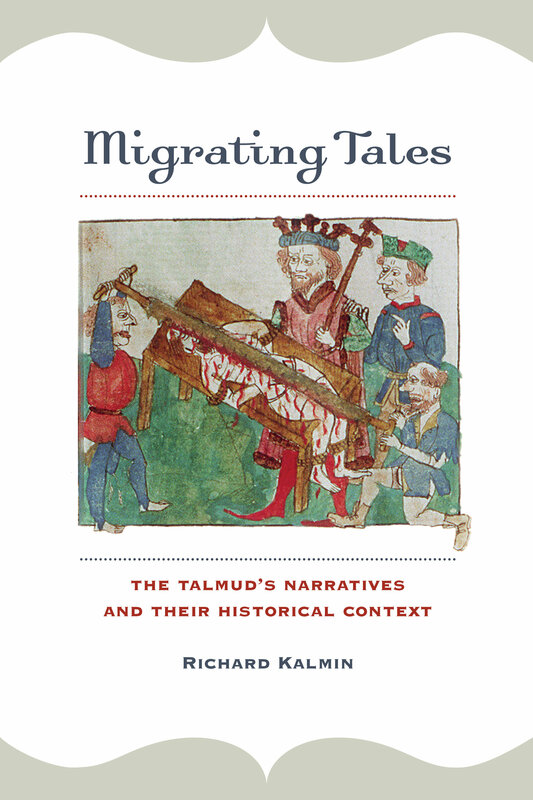 The Ancient Jew Review's interview with Dr. Richard Kalmin.